Todd Hodnett, President of Accuracy 1st®, has now joined forces with Applied Ballistics® and Kestrel® Weather & Environmental Meters to advise on the development of ballistics solutions that work in the real world. Todd Hodnett, President of Accuracy 1st®, has now joined forces with Applied Ballistics® and Kestrel® Weather & Environmental Meters to advise on the development of ballistics solutions that work in the real world. This all-star team is committed to maximizing customer value by integrating shooting science, ballistics modeling and environmental data into software tools, hardware and rugged platforms that create a unified ecosystem. Todd Hodnett is considered one of the most respected precision shooting instructors in the world. With more than 20 years of experience, Todd has traveled the world training soldiers, hunters and enthusiasts in the art of precision shooting. Todd and the Accuracy 1st team focus on creating and teaching tools and methods that make the complex science of shooting accessible in high-speed, high-stress situations. Ballistician Bryan Litz, the founder of Applied Ballistics, also has years of experience sending actual rounds down range, measuring their performance and fine-tuning the Applied Ballistics calculator and custom curve library to account for virtually every shooting and environmental variable for an on-target first-shot firing solution. Bryan and the Applied Ballistics team are continuously developing and expanding their product offerings to create an integrated system of ballistics data, software and online tools to support recreational, competitive and professional precision shooters. Kestrel Weather & Environmental Instruments has been known for building rugged weather and environmental meters for almost two decades. 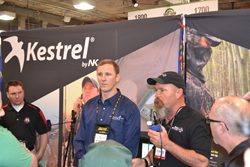 Kestrel Meters have become the tool of choice for any shooter or hunter seeking accurate readings on the environmental variables that impact a long-range shot. In 2012, Kestrel introduced the first integrated weather meter with a full ballistics calculator on board, eliminating the need to carry a separate weather meter and ballistics calculator. More importantly, this integration allowed for firing solutions to be instantly updated for changing weather conditions. In 2013, the Kestrel team worked closely with Applied Ballistics to integrate the Applied Ballistics calculator into a Kestrel weather meter as well as the ability to access and load the full Applied Ballistics custom curve library. Todd Hodnett, Bryan Litz, and the Accuracy 1st, Applied Ballistics and Kestrel teams will now all work together to develop advanced precision shooting tools for real-world shooters and hunters. Their partnership represents a long-term intercompany commitment to continuously create and improve innovative solutions in response to customer input and provide the education and training to help customers make the most effective use of those solutions. For more information about the strength and abilities of this powerful partnership, visit Kestrel’s website at http://www.nkhome.com/about/partners/. All Kestrel meters are small, lightweight, extremely rugged and easy-to-use. They are not only built to military standards, but have proven their reliability over years in the field. Every Kestrel meter is designed, developed, built, tested and supported in the USA.